Swarovski crystals and Czech glass beads in Aurora Borealis. Swarovski crystals and Czech glass beads in Multi-color. Swarovski crystals and Czech glass beads in Amethyst. Swarovski crystals and Czech glass beads in Aqua. 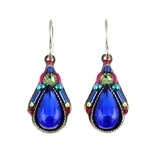 Swarovski crystals and Czech glass beads in Royal Blue. Swarovski crystals and Czech glass beads. 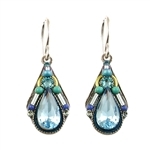 Diamond-shape earring with bright blue crystal and beaded inlay. Swarovski crystals and Czech glass beads. 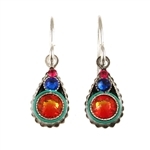 Tear drop shaped earring with crystal accent at the bottom. In Chrysolite.